Founded in 2000, FamilyTreeDNA.com is the largest company in the world that is 100% dedicated to DNA-based genealogy. We think Family Tree DNA’s autosomal DNA test, Family Finder, is the most complete package available for amateur and professional genealogists today. It’s not perfect – no DNA tests we’ve tried are. But if you only have budget for one test and you’re serious about knowing where you stand, then Family Finder is the one to buy. Making new contacts is a breeze, because FamilyFinder provides the names and email addresses for new DNA matches. No other service makes it this easy to connect with potential family members. If that’s not enough, FTDNA provides the best training and education webinars in the business and actively supports the global genealogy community by hosting an annual conference and sponsoring many others. I guess you could call us fans – but with good reason! Since it was first released on the market in 2010, Family Finder has helped hundreds of thousands of people worldwide to find new relatives and discover precious information about their genealogy. One of the reasons I believe the Family Finder test is better for serious genealogists than AncestryDNA and 23AndMe is the fact that it is operated by a trustworthy and reliable corporation that begins with the assumption that your DNA data is yours – you own it and have a right to move it in and out of their system as you see fit. They also employ some of the best genetic engineers and doctors in the world. Family Tree DNA, the company behind the Family Finder autosomal test, was founded in 2000, based on an innovative idea conceived by Bennett Greenspan, a reputable genealogy enthusiast, who managed to discover two unique formulas for using genes to determine ancestry. Mr. Greenspan found existing DNA studies whose results he used to determine his own genetic background. Greenspan soon discovered that he had several cousins in various countries around the world, namely in Argentina, Asia, Eastern Europe and UK. He then implemented the original Family Finder test (called the “Walk through the Y” test) which in the beginning depended on two testing methods – mitochondrial DNA and Y-Chromosome STR. In 2006, Greenspan and Max Blankfield invested in assets owned by DNA-Fingerprint, which accelerated their testing capacity. The first Family Finder autosomal test was launched in 2010. Initially, Family Finder used the Affymetrix microarray chip for testing, but they soon switched to the Illumina OmniExpress chip which offers much better results. All of their patients tested with the old method received a free re-test with the Illumina OmniExpress chip so they could enjoy more accurate results. Notably, the staff from Family Tree DNA were also instrumental in developing the $199 National Geographic Genographic 2.0 test. Connie Bormans, the lead scientist for Family Finder, is an important consultant for the National Genographic Test. Customer support is a critical factor for first-time DNA testing customers, because there is a steep learning curve involved to use all of the services & tools available. Most of the users of the Family Finder test give 5-star feedback to the company’s customer service team. The company recently received the Reward of Excellence for Professional Customer Support from the BBB. Indeed, I find that the customer service representatives from Family Tree DNA are versatile in answering questions and very knowledgeable of genetic testing – and friendly. In addition, their project admin support is unique in the industry. If you run a larger project that crosses geographical or family tree lines, FamilyTreeDNA can provide you with a dedicated project liason to help you keep everything organized. When contacted, the average responsiveness of DNA matches found on FTDNA’s platform is very high, and the average level of genealogical knowledge among those matches is also very high. Far better than AncestryDNA and 23andMe, where the users tend to be much harder to contact and respond much less frequently. Ancestry’s users also tend to be less knowledgeable and less serious about DNA matching. DNA samples taken by the FamilyFinder test are stored at the Genomics Research Center in Houston, Texas, under close supervision of the staff from Family Tree DNA. They store customer samples for a minimum of 25 years. FTDNA’s parent company, Gene by Gene, places a huge emphasis on security, and they’ve invested millions of dollars in offline and online security of your information. All financial information is encrypted using the latest technology, and the lab is supervised 24/7. This is one area where the Big 3 test providers differ widely. If you don’t want your data shared with third parties, then FamilyTreeDNA is the company you want to use. FTDNA will always ask you for your consent if they want to share your genetic data with anyone, on a per-event basis. If during the 23AndMe signup process you consent to research use of your data, then they can sell access to your DNA data to pharmaceutical companies; and, they reserve the right to blend your data with others and sell the commingled product. If you consent to research use of your AncestryDNA data, then they are free to share your genealogical, genetic, and health data with any third-party research firm. With these two firms you can only choose to participate fully, or not at all. Unlike other providers, Family Tree DNA offers you full access to the raw data generated by their testing process. This means you can use your DNA data in other tools to verify matches, perform health screenings, and more – without having to re-test your family. Family Tree DNA is also the only service that allows upload of raw data from other companies. Using their public DNA database sites ySearch and Mitosearch, you can compare yourself with people who tested elsewhere, if they uploaded their GEDCOM, Ancestry DNA or 23andMe raw data files. (Note: for 23 and Me, you can only upload files from November 2010 to November 2013). 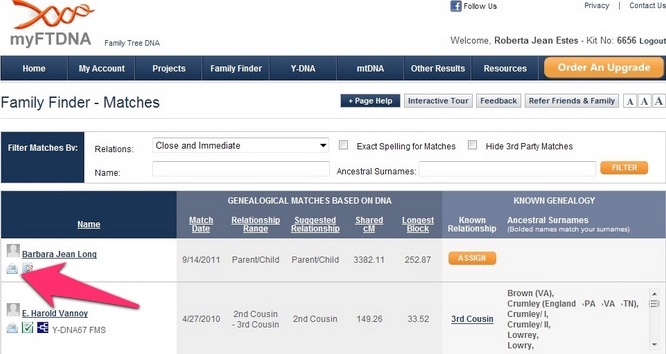 FTDNA’s open data policy is a major reason I recommend Family Finder for family genealogists. You can feel comfortable using FamilyFinder as your “base of operation” for future family projects involving other vendors. Family Finder is also the only test (in addition to its sister test National Genographic), that is broadly used by people worldwide. In contrast, AncestryDNA is only available in UK, US, Ireland, Australia and New Zealand. 23andMe is available in 56 countries, but many of the countries have little coverage. Family Finder’s DNA database has grown quickly since its release in 2010, and now has over 750,000 samples from people worldwide (140,000 autosomal). Ancestry.com and 23 and Me have larger databases of over 1 million people each. But their databases are skewed towards US, Europe and UK populations. Family Finder’s samples come from over 200 countries. 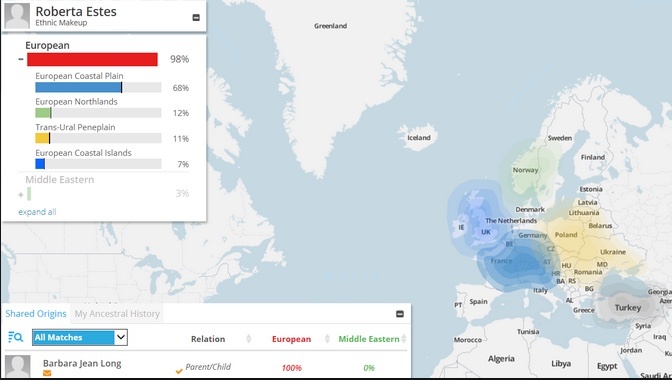 23andMe also has an advantage over FamilyFinder for European ancestry, but Family Finder has a huge advantage over all other tests for non-European populations. You can find a complete explanation of these groups on the FamilyTreeDNA website. To collect DNA data, Family Finder uses a cheek swab sample. The other two companies, 23 and Me and Ancestry.com, use 1 cc of saliva. Both methods work fine. Whole-saliva samples provide better DNA yield, but cheek swabs are better at testing very young and very old people, who may not be able to produce the amount of saliva needed for the test. The lab testing process is the most important part of any autosomal DNA test, and the technology used by Family Finder is the most accurate in the industry. 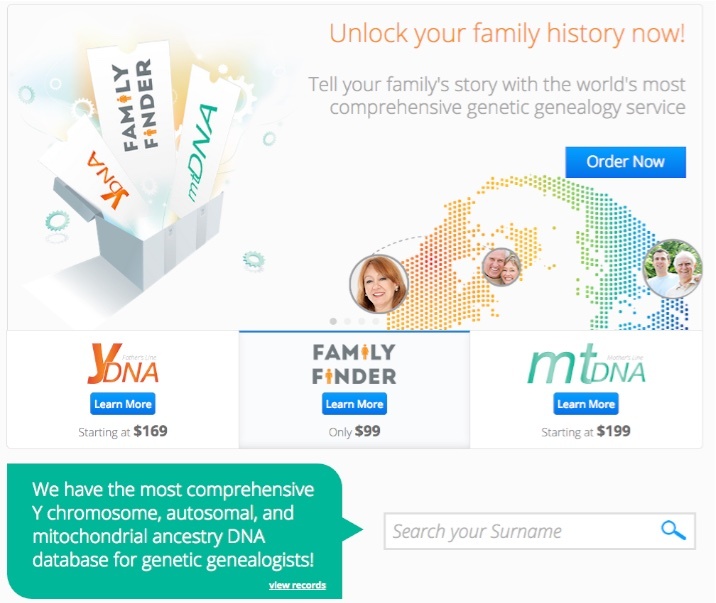 The testing chip used in the Family Finder autosomal test is identical to the one used by AncestryDNA. Both use the Illumina OmniExpress chip. On the other hand, 23 and Me uses a Customized Illumina chip, while the National Genographic project uses the most advanced Customized Illumina OmniExpress chip. The criteria for matching segments used by Family Tree DNA is 7.69 cMs (centiMorgans) and as little as 500 SNP’s for the first segment. Additionally, the start and stop positions in the test are rounded to the nearest block of 100 SNP’s. While Family Finder and 23andMe both provide information about the number of SNP’s and matching segments on the X chromosome, Ancestry DNA does not provide these information. FTDNA offers several tools to help you uncover your ancient ancestors and to discover their migrations over time. MyOrigins is FTDNA’s ethnic ancestry tool. After entering the geographic coordinates of your earliest known ancestor, you can compare your ancestor’s location with the ancestors of people that your DNA matches. 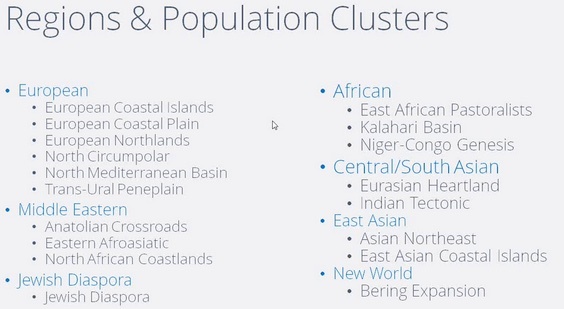 MyOrigins matches your DNA to one or more of 18 regional and population clusters. As with all ethnicity tests, you need to take the results as a general guide, not the biblical truth. That said, the technology used for MyOrigins is generally regarded as the most accurate of its kind. It’s the same tech used in National Geographic’s Geno 2.0 Project. The myFTDNA user interface provides access to several tools to help you interpret your results and find DNA matches in their database. The FTDNA data base includes results for all tests taken, in one location. Their search engine is particularly well-done, with results automatically displaying surnames and haplogroups wherever the information is available. If additional tests have been taken, search results will display Y-DNA and mtDNA haplogroups. 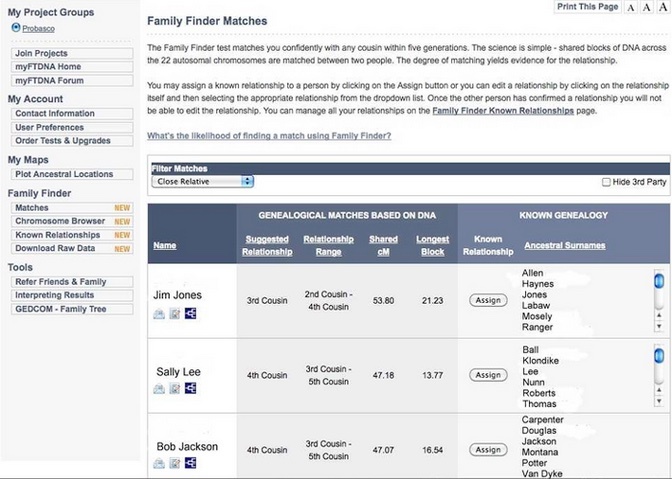 Family Finder provides access to a chromosome browser (see above) that lets you compare up to 5 matches at a time and see which DNA segments match. It also offers an in-common-with feature, and you can search by surname or by ancestral name. Family Finder makes it super-easy to reach out and contact any matches using their real name and email address. To do this, just touch the email icon next to their name. Simple! FTDNA currently hosts more than 8,000 projects that anyone can participate in for no additional charge. 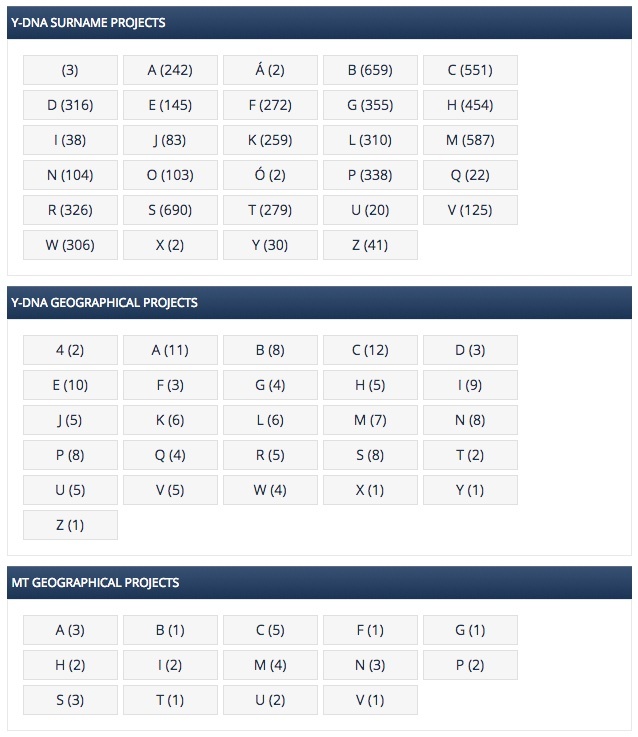 There are projects for specific surnames, geographic areas and haplogroups. You can compare your DNA to specific projects or groups of projects, too – which can provide a faster path to answers. Unique in the industry, FTDNA also provides online tools and dedicated project liasons to help project administrators get a project launched and to keep the information flowing and accurate. With so many wonderful tools at my disposal, I do wish their user experience was more streamlined and unified. Their search experience is absolutely the best in the business, though. The site can be slow to load, and I find their forums and learning center not as helpful as AncestryDNA. Not the best in the business. But more than usable. The standard autosomal test from Family Tree DNA helps you find your relatives and discover your genealogical and ethnic roots. With this test, you can validate uncertain relationships, discover unknown family members you may have and connect with all new relatives who are still alive. You can also gain insights into your ancestry, discover more about your ethic background and confirm your family lore. With the Family Finder test, you can find relatives within 5 generations. This test uses your Y-DNA to uncover your paternal heritage. It enables you to trace the genetic history of your surname, to join free surname research projects and to find exact genetic matches. You can trace your ancestry back to the first century AD, linking your name to important historic events and discovering your forefathers. For greater confidence, you can upgrade the number of DNA markers used to match from 37 ($169) to 67 ($268) or 111 ($359). Mitochondrial DNA (or mtDNA) is passed unchanged from mothers to their children. With this test, men and women can trace their maternal ancestry and uncover their heritage. FamilyTreeDNA’s mtDNA test is effective in validating or disproving siblings and in tracing your roots through your mother’s direct line. FTDNA’s mtDNA test covers the full sequence of all 16,568 markers in the mitochondria. FTDNA is the most complete & useful solution for DNA-based family genealogy research. FamilyFinder’s ability to verify matches, the high responsiveness of matches, the sophistication of their biogeographical analysis and an open data policy work together to deliver more DNA matches and relatives, in the real world. If you only have enough budget for one test, then this is the one to buy. DNA samples from 200 countries and 60 populations worldwide. Ability to import DNA data from other services including GEDCOM, AncestryDNA and 23andMe (V3 chip). Ability to export your raw DNA data to use in other tools. Use of autosomal, Y-chromosome and mtDNA markers. More data means more matches, greater insights and better accuracy in matching. Excellent customer support. Their people are responsive and trained on genealogy. Email addresses and real names on DNA Matches. And they even respond! 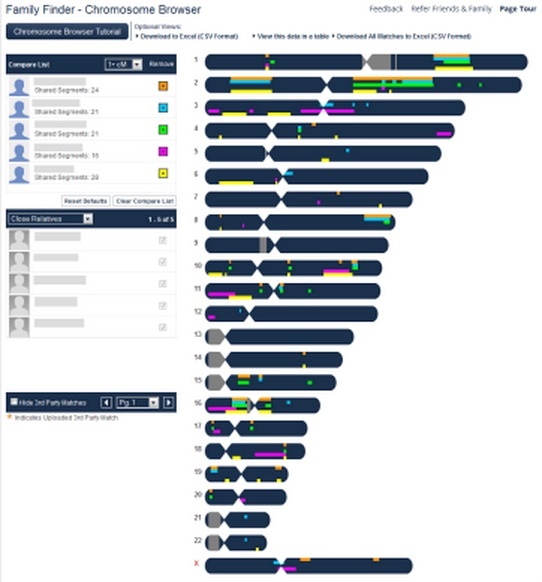 Chromosome browser which includes in-common-with feature, search by surname and search by ancestral name. You can compare up to five matches at a time. Customer support and features designed for larger projects like this one. For example, FTDNA provides separate tools for project admins vs. participants. Built-in support for analyzing endogamous trees such as Cajuns, Romani, etc. All test results are displayed in the same interface. This includes Y-chromosome and mtDNA haplogroups, if you also purchased those tests. In-house technology: DNA is kept on file for 25 years, and testing performed in in-house lab. A personal laison is provided to assist larger project administrators. FTDNA’s webinars & conferences are the best in the business. Other users are responsive and are serious genealogists (like Ancestry.com). Privacy guarantee. They will not sell your data in any form to third parties. Prior consent will be asked if you are invited to participate in research, etc. It’s hard to triangulate DNA matches down the line. It’s impossible to compare a DNA segment of your match vs. the same segment on a match’s match. Misses some minority admixture that other vendors catch. their Learning Center & Forum need work: compared to Ancestry’s learning center and its comprehensive and insightful forum, Family Tree DNA offers less useful information inside their platform, and their forum is pretty clunky. User interface is not that great: the site loads slowly and has poor color choice – white background and some colors spread across the page. Information can be hard to find and some important tabs are scarce. Fewer samples in the database: compared to Ancestry and 23andMe which both have 1,000,000 people in their databases, Family Tree DNA has only 350,000 worldwide DNA samples. However, all of these databases are growing very quickly. Family tree tools are hard to use, especially for larger trees. Need more features and refinement. With FamilyFinder, your family can find new relatives and ancestors from 6 continents going back as far as 5 generations and verify the accuracy of your match. If you’re looking for a high degree of accuracy, global DNA coverage, open access to your DNA data, the ability to verify your matches and access to match emails and names, Family Finder should be at the top of your list.